There will be people that read this that scratch their head daily when looking at Temporary Traffic Management (TTM). They will see the signs and cones, and Traffic Controllers and challenge why things are done a certain way. Why the A-B journey isn’t simpler. I might not answer that in the course of this post, but I will seek to explain the challenge that TTM faces, particularly in Auckland’s CBD. I will also seek to generate thought, that just maybe – the effort that goes into those cones and signs is a bit deeper than what some might think. Auckland’s CBD is awash with cones. With the commencement of the Downtown Infrastructure Development Programme (DIDP) in late December – the picturesque waterfront corridor of Quay St is now also enveloped. 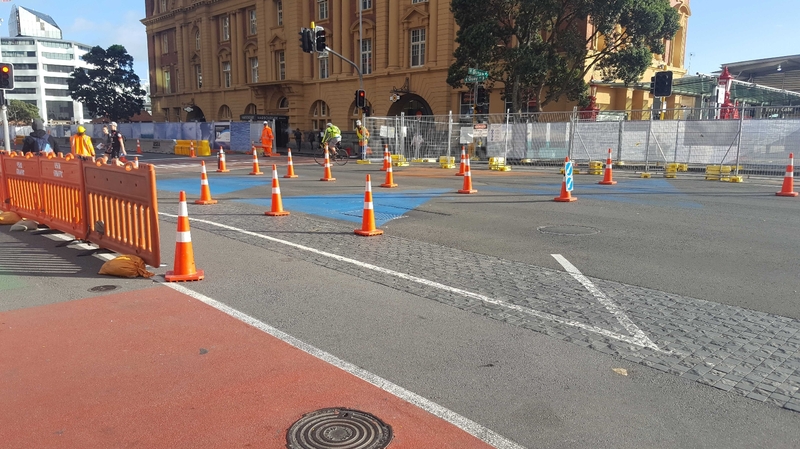 Looking ahead to the construction of the CRL C3 contract later this year, some form of Traffic Management will exist on every major arterial road in Auckland Central bar one. As of March 15 2019, there were 38 active property development projects under construction in the CBD (up from 26 in July 2018). Alongside this, there are 8 major infrastructure projects. The pace of construction is frenetic. Utility upgrade work is also under way, to support this growth. Vector, Chorus, waste water, storm water and bulk water upgrades are all concurrent. A recent example of these works being the combined service trench work on Quay St undertaken over the Christmas holiday period. This saw a one-way road closure to facilitate the installation of new services supporting the upcoming seawall upgrade. This now interconnected web of Traffic Management has challenged organisations, systems and methodologies in a ‘never-before-seen’ way in Auckland. The Auckland CBD as a worksite. Post-earthquake the people of Christchurch were burdened with a challenge of resource and methodology. How could they effectively turn the city into a continuous worksite, whilst still maintaining function? The establishment of SCIRT helped. API-based real-time network information for any who wanted it. In short – the ability for Christchurch to adapt its approach when faced with a ‘city of cones’ resulted in innovation, and a management system now that demonstrates efficiency and harmony in comparison to other urban centres. Now it’s our turn Auckland. In 2017, Auckland Transport (AT) adopted the same Traffic Management coordination system as the Auckland Motorway Alliance (AMA). The system, MyWorksites, is based on the TMP for Chch system and allows full visibility of all Traffic Management Plans (TMPs) across Auckland (State Highway and Local Road). notify who the onsite supervisors are, each day. The number of submitted ‘Worksites’ in March 2019 across AT’s network was 2209. In March 2018 that number was 1603. A 37% increase in worksites – all serviced by an unchanged compliment of AT staff. 12 ‘coordinators’ oversee these applications and 6 ‘advisors’ work on-road to oversee compliance. A result of MyWorksites adoption is visibility of adjacent work. Previously – it was primarily the AT coordinators that managed conflicting activity on their network, ensuring no two contractors operated in the same space. This has now been passed to contractors to self-manage – requiring any applicant to ensure no clashes exist before approval can be given. The CBD presents a unique challenge with this method, as worksite overlap is universal. Enter Auckland’s Transport Operations Centre (ATOC) and their Central office on Queens Wharf. The Central City Network Operations (CCNO) group seeks to manage this conflict at a higher level – providing oversight of the construction activity (amongst other things) across the CBD. AT Metro, Auckland Council, Special Events, Traffic Operations and the CBD’s sole Corridor Access Request (CAR) Manager are represented. The goal is to retain some semblance of function in the CBD with such an immense amount of construction. Kudos to AT then? For seeing the problem and enacting a solution to keep things moving right? Well – sort of. One of the main necessities of this system is communication. The CCNO needs visibility of upcoming works and the intended methodology. What is presented from the project owner (AT, City Rail Link Limited, Precinct Properties for example) may not be how the contractor chooses to undertake the work. It’s only when a Traffic Management Plan is submitted that the CCNO have their first true chance to evaluate its impact on a road. 15 days out (AT’s promised TMP review window) is a short period for review and request for change if the contractor methodology is different from what the Principal hypothesised. Therefore, early contractor involvement is key (both by AT themselves, developers and other Principals) to ensure accurate projection of potential work. Right now – the ‘wait and see what the contractor is going to do’ approach isn’t working. That sole AT CAR Manager (for the CBD area) is burdened with reactive network management. But what about the implementation of TTM? Being involved in many of the current CBD projects I’m abreast of many of the complaints and concerns of local stakeholders. Many are valid. The plethora of construction in Central Auckland means inevitable constraints – mainly with space. Balancing private vehicles, public transport, pedestrian access, cyclist access, parking, commercial activity, and construction is at present like dividing a cupcake amongst a rugby team – everyone is going to feel unfulfilled. New Zealand’s Traffic Management standards are governed by the Code of Practice for Temporary Traffic Management (CoPTTM). The NZTA maintains the CoPTTM and via a CoPTTM Governance Group, review elements of the Code and ensure its appropriateness and currency. The origin of the CoPTTM traces back to the late 1980s. In its current form, its backbone is based on the country’s rural state highway network – hardly similar to dense urban Auckland. Apart from a ‘technical note’ issued in 2017, the 567-page CoPTTM deals very little with dense urban environments and even less with long-term worksites. There is very little guidance on interaction with Traffic Signals (1/2 page), and only a small section specifically for cyclists (1 page). Enter Auckland’s CBD and the guidance within the CoPTTM is challenged by, a never-before-seen conglomerate of construction and a local authority straining to retain network function. Traffic Management is based on risk assessment of the task being introduced into the road environment being affected. The principles are based on proven engineering – from the spacing of signs to visibility and installation standards for equipment such as cones and barrier systems. Implementation (both in design and on-road delivery) applies that engineering science – the principles are employed in a multitude of ways to achieve a “safe system” outcome. There is no single right answer. Ultimately Traffic Management is about safety – achieving safety of road workers and road users (in all forms). To do this – TMP Designers (referred to in the CoPTTM as “Installation Designers”) prepare TMPs that are in accordance with the CoPTTM. These proposed TMPs are regularly in direct conflict with optimal road network function. From narrowing of footpaths to reducing lane availability to redirecting cycle lanes, there is an inevitable impact on normal operating conditions. As work duration, worksite size, and existing road user volumes increase – disruption increases exponentially. The challenge is, reducing disruption often violates safe working principles. This cannot be an accepted compromise to safety. A delay to journey times must never be used as an argument against the health and safety of anyone. Night works are favourable from road user volumes perspective, but not for noise and vibration. Holiday period works are viable but are a significant strain on resources. There’s no quick fix to achieve harmonious construction activity and normal road network function. Since 2016 Auckland’s CBD has had at least two major Traffic Management operations undertaken over the Easter and Christmas holiday periods each year. The 2017/2018 Christmas holiday period saw two adjacent major road closures on Nelson St, one for upgrading the Vector 22kV network and one for major utility upgrades associated with the New Zealand International Convention Centre (NZICC). The combined cost of both Traffic Management operations reached almost $0.2mil NZD. NZTA historical data produced in 2013 showed an approximate 5-10% (for ) contract value spent on Traffic Management. A recent cycleway upgrade project in the CBD produced a Traffic Management spend of 46% of total contract value. Remembering, any contractor ‘changing the normal operating conditions of the road reserve’ must manage and mitigate any hazards they introduce. The more impact, the more management required. Dense urban environments will have a disproportionate level of Traffic Management to the work being done. The current risk I observe is two-fold. Firstly – in the unrelenting pursuit of better corridor and network function the desire is to constrain working room, reduce safety measures and reduce working times. This results in longer projects and increased contractor risk and adapted work methodologies that ask for unacceptable safety compromises. A great example is Water Filled Barrier Systems like this one. Their purpose is to ‘redirect errant vehicles’ – by doing so they deflect (absorb that impact and shift laterally). The space required for the system with the least deflection on the market currently is 2.1 metres. That’s the space required to be clear behind the barrier system for it to perform safely. Space constraint of working area results in this being compromised regularly. Upgrades of barrier systems (to steel and concrete options) are becoming more common to restore more safety margin. This costs more. The second danger comes from this increased cost. The conflict between disruption and safety results in methodology adjustments for construction that significantly increase the spend required. Often Traffic Management costs exceed budgeted amounts. Of Auckland’s current 4 State Highway projects – three have exceeded their total project Traffic Management allowances (the one that hasn’t only started in 2018). But what about quality? The end user (be it driver, public transport user, cyclist, pedestrian) sees two main things – disruption and clutter. Their measure of quality is how little they see it and how little it impacts them. Contrastingly – the better the Traffic Management the more ‘positive’ it is – meaning the more effective it is in adjusting behaviour. Unseen Traffic Management is generally ineffective. One simple example is that of Temporary Speed Limits (TSLs). The implementation of which is risk assessed. The CoPTTM provides guidance on this through a matrix aiming to achieve consistency across New Zealand. In 2014, penalties for contractors leaving inappropriate speed limits in place were increased – resulting in an instantaneous non-conformance notice for responsible parties. For temporary speed limits to be effective, they must be justified, noticed, appropriate, and adhered to. Unfortunately, some continued contractor laziness, coupled with poor planning, installation and overuse – results in an overall lack of road user compliance. The outcome is unseen, ineffective, Traffic Management. My daily mission is to increase people’s awareness of Traffic Management and its purpose. To educate principals, contractors, consultants, stakeholders and the general public around why Traffic Management is important and the role it plays. Part of that is too often being a referee between AT and contractors to balance needs and navigate the maze between network disruption and construction productivity, cost and above all safety. To truly achieve harmony, we all need to do better. Better at educating society around Traffic Management – a simple inclusion in New Zealand’s Road Code would be a start. We all need to do better at keeping our people safe while working on the road. And, we all need to adopt a more pragmatic approach to dense urban Traffic Management and work closely with the people that must deliver it. When it comes to Traffic Management – the more understanding the better. For those who see it and critique it, I ask one simple thing – “seek first to understand, then be being understood” – Stephen Covey. Dave Tilton is a Traffic Management Consultant across many of Auckland CBD’s major projects and an NZTA Trainer/Assessor of Temporary Traffic Management. Has a contractor ever been fined in the history of civilization for leaving signs out inappropriately? a not unheard of practice! And why do the people who put these out, accompanied by the obligatory cones see blocking footpaths with them as safe, rather than use the road to stand them on. This is especially when they are not in use they just leave them across the entirety of the path, Park Road at Grafton station two days ago springs to mind! Waspman, I suspect like any profession there are non-compliant and poorly trained practitioners. I’m sure your sweeping generalisation of “these people” is referring to these practitioners. I also suspect AT would greatly appreciate reporting of unsafe operations on their network given they struggle to cover everywhere. In answer to your question around fines – yes contractors have been fined for redundant equipment. Yes, some signs near the 277 redevelopment in Newmarket were blocking a footpath on Gilles ave for a while, but a message to AT, and they were moved to not be in anyones way within 2 days! Very satisfactory. I routinely report cars parked on the footpath in my area and AT are very good at responding. After a couple of years there are very few cars on the footpath, it definitely works. I have reported that before on the footpath on Hobson Street. I don’t remember anything coming back. Reporting is luck of the draw. Proactive enforcement is what we’re entitled to. The costs of enforcement should be met by motorists – that’s even embedded in transport’s most neolib policy document, the Future Funding Strategy. But we don’t get proactive enforcement because AT have been picking and mixing from even the neolib stuff… I’m sure that’s not how they see it, but it’s how it works out. What an important post! Thank you so much. Road controlling authorities (the local council, unless it’s a state highway) are also the ones that receive the complaints from road users who don’t like being slowed down or inconvenienced by worksites. For years this has resulted in a steady erosion of safety margins in order to reduce the ‘impact’ on traffic flow. As with other traffic engineering problems, everything else must be sacrificed to the traffic flow gods. A few weeks ago 3 road workers were killed in the Bay of Plenty. They were carrying out a routine culvert cleaning operation using the same TTM mobile operation that any contractor around the country would have used. NZTA has reacted by greatly raising safety standards. Mobile operations on state highways where workers leave the vehicles are now pretty much banned. It’s expected that temporary speed limits will be used much more frequently. Other changes are expected too. It’s unfortunate that it took such a tragedy for the pendulum to start to swing the other way but it’s long overdue. So don’t expect TTM to get any less invasive. Rural state highways don’t have much in common with the Auckland CBD but hopefully the benefits of a greater focus on safety will flow through to urban TTM operations. There’s a lot of scope to improve safety for pedestrians and cyclists around worksites. Access for Everyone has the potential to revolutionise the CBD in many ways. From a TTM perspective it’ll present the challenge of there being fewer alternative routes to any given street you want to work on. However it’ll have the massive benefit that there will be no through traffic. Traffic flow will be explicitly deprioritised and worksites will be able to be looked at with safety top of mind. In the city centre, Council is painfully aware that the road space is unfairly allocated at present, and they intend to reallocate it. Why would they not bring this forward now in order to maximise worksafe and road user safety? What possible rationale is there for prioritising traffic flow as some kind of a measure of success? AT need to cut back on the number of traffic lanes now to give space to barriers, and working space, without reducing safety of road users. The CBD is a building site because previous generations have neglected infrastructure, I welcome the chaos, it shows we’re fixing things. There will be disruption around the Panmure roundabout and other key intersections but I don’t think it’ll be that bad. AMETI is essentially a road widening project, something contractors have a lot of practice at. Ignorance is not a defence. I noticed it when connecting from a bus from Birkenhead, to the City Link. The footpath was blocked at the corner with Halsey Street. At first I couldn’t figure out why. Turns out I had walked up to the sign from the back side. The footpath was closed west of stop 1315. The other stupid thing is that temporary traffic signs are often blocking the footpath for no reason. Almost all streets are wide enough to put these signs on the roadway without blocking anything. Hats off to the the people controlling the intersections and crossings on the ground at Quay Street. Lots of changes daily/weekly to layouts, pedestrians, cyclists and vehicles all trying negotiate the new arrangements and some trying to shortcut the routes! These people have been nothing but good mannered, effective and doing their work in good humour! I ride through the maze most days and if the cone world continues to be managed like it is now, there won’t be too many issues. Tough job being the very public interface on a very fluid site! I think NZ drivers are particularly bad at ignoring speed restrictions around roadworks. I once did a ten day road trip through Victoria and New South Wales and learned very quickly that aussie drivers are fastidious about slowing down to the posted speed limit at roadworks. Try doing 30kmh past a construction site here and the drivers behind make it very clear that you are being a pain. It must be a cultural thing. Societal acceptance, or non acceptance, of a behaviour is most powerfully signalled by effective leadership, Government leadership. New Zealand enforcement of speed limits is incredibly slack compared with Australia, and Northern Europe. Government leadership and consistant reinforcement by enforcement, actually sets the standard and society follows with a bit of a lag. Here in New Zealand we had a Government that strongly, but indirectly, signalled to the NZTA, by way of both budget allocation, and statements endorsing less government in our lives, that enforcement was not a priority. Traffic police could be substituted for a television advertising campaign and “education” as a preference to enforcement. The inevitable result, is that if our appropriate institutions do not see strict law compliance as a priority, why should it’s residents. I have recently spent 2 weeks in Sydney and observed as I crossed a Pedestrian Crossing Auckland Style that drivers there would stop whereas I believe that an Auckland Driver would have played their My Car Rules card and continued on. Don, I agree. How many Traffic Police could be funded by a Raised Pedestrian Crossing? Are Raised Pedestrian Crossings compatible with Light Rail Tracks? Putting money into enforcement would probably reduce the number of Road Cones. I don’t think pedestrian crossings are compatible with light rail, let alone with a raised table. Light rail is proposed to have signal priority so any pedestrian crossings would have to be signalised. Interestingly as a cyclist or pedestrian, I often feel safer around a worksite on busy stretch of road or intersection where there is temporary traffic management in place, than I do normally when there is no worksite. The effect of the TTM is of course to slow traffic down and focus the attention of drivers on the worksite environment and its hazards which may include cyclists and pedestrians as well as road workers. The former benefit from the safety regime intended to protect the workers. What is utterly incongruous is that where there is no worksite (i.e. most places), cyclists and pedestrians have a far lesser level of safety provision and are not afforded the protection considered so important for road workers. Why is this? Why is a road casualty treated so much more seriously if it is a road-worker, than if it is a cyclist or pedestrian not-at-a-worksite? As LogartihmicBear points out in a comment above, any casualty among road workers is likely to result in sweeping and urgent changes to practices, to make damn sure that it won’t happen again. Non-worksite casualties (cyclists, pedestrians, and even innocent-party vehicle-users) are effectively shrugged-off. Business continues as-usual. There are no urgent sweeping changes. And of course it does happen again…. And again…. And again. I’ve experienced the same phenomenon, Dave. And passing the construction site sometimes has lots of good “walkability” measures, too, such as interesting activity, real people doing stuff, nature – even if if it’s just a muddy hole, sometimes a friendly TTM worker, instead of being a blank mirror-glass wall or ground floor carpark. I suspect in some countries they actually do this but for goodness sake don’t tell the AA. Aussies slow down to posted speed at roadworks because the police have a reputation of enforcing the limit. My wifes uncle got pinged, which got him to slow down (and curse under his breath) when he encountered roadworks. Point 1 already exists – AT do charge a daily fee for a lane closure on a busy road (around $250 depending). Point 2 – This exists somewhat on the Auckland Motorway network but not on AT’s network. Auckland Transport (in recent experience) despise full road closures and actively challenge their use when proposed. Unfortunately, in NZ we aren’t quite at that stage where NZ Police will enforce temporary speed limits universally. There is still significant overuse of Temporary Speed limits that are not enforceable (i.e. they have to be ‘appropriate’ and if they aren’t are unenforceable). Furthermore, they are riddled with non-compliance – paperwork requirements are very precise when changing the permitted maximum speed of the road – the placement of signs to the times and locations noted on the paperwork of the Site Traffic Management Supervisor (STMS) who installs it. Any mistake in this chain then it is unenforceable. Unfortunately, this has resulted in significant cancellation of tickets in the past and created a ‘distrust’ I believe of Temporary Speed Limits by the NZ Police. Until contractor compliance and precision is improved – the desire for enforcement will remain low. Multiple comments above about speed restriction signage being placed on footpaths to the detriment of pedestrians. I’ll add comment about two I navigated today. Remuera Rd at St Marks Rd intersection and outside the Downtown Carpark in Customs St West. Both blocking half or more of the footpath and in the case of the downtown one marked as temporary. The works have been underway for some time now so why can’t a better location for the sign be found. Add to this the signs I see that have been tuned parallel to the road when works are not underway. Perfect for a pedestrian to split their head open on! When the Upper Harbour Bridge duplication works were in progress, they had a temporary speed restriction of 70kph on the motorway. The formal notification had the 70 applying between 6am and 8pm, meaning the normal 100kph applied between 8pm and 6am. But they would leave the 70kph signs up 24/7. I was aware of the notification and so would do 100kph past the 70 signs on my way home from work. On one occasion a police officer pulled me over and ticketed me for doing 98kph in a 70 zone. Needless to say, the ticket was cancelled the next day when they tried to process the ticket and their computer system flagged it as being a case of ticketing me for doing 98kph in a 100 zone. I think contracters get pinged for leaving speed restriction signs in place when they are not supposed to, so it doesn’t happen much anymore. You usually see the signs lying flat on the ground at night. Any chance you could do something equally clever about the signs they leave flat on the ground as a tripping hazard? Put cones around them with a sign that reads “sign on ground ahead”? Great article. TTM is hard enough on a rural highway, I hate to think what it must be like in the city centre. Of course, the designers are shafted by the council/AT being unwilling to impact private vehicles seemingly at all. WRT non-compliant/poor TTM, I think AT need to set up a dedicated phone number for this and train some phone staff. Its so common to see a footpath blocked instead if a sign in a parking bay or see a sign in a cycle lane with no advanced warning. The best contractors all use Parallax. Dave knows the CBD flows better than anyone. From an STMS point of view, the few times I’ve driven through lately things have looked co ordinated and tidy. Could it be…. that 700 million road cones were bought for the Canterbury rebuild, enough to garland every piece of tarmac in the whole of Christchurch – and now that they have completed that work, some bright contractor has bought the whole job lot and brought them up to Auckland ? Possibly leaving half of them in Hawkes Bay on the way up, where they have a slightly different way of using cones. They’re not actually doing many roadworks – they just have miles of road cones. Saves having to hire a warehouse to put them in, I guess…..